Digital microfluidic biochips (DMFBs) manipulate droplets of fluid on the micro-liter to nano-liter scale (that’s really tiny) to perform biochemical reactions called assays. Some of the most popular assay applications for DMFBs are in-vitro diagnostics and immunoassays used in clinical pathology, DNA amplification applications, and protein crystallizations used to help determine the structure of proteins. 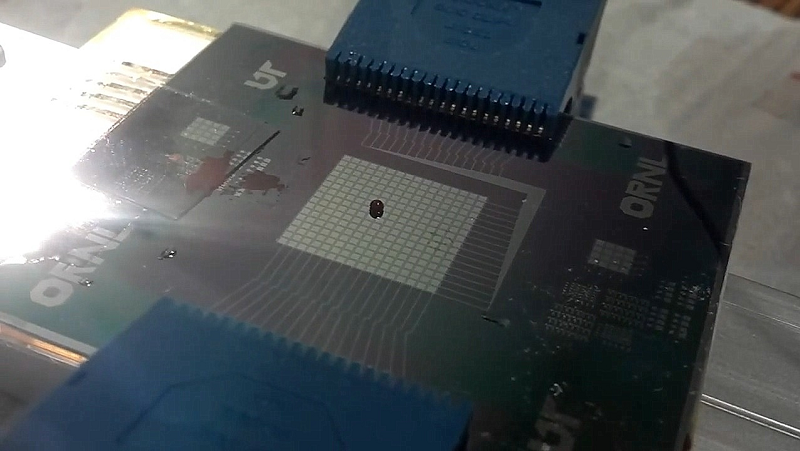 A droplet on a digital microfluidic biochip. A DMFB is a 2-dimensional array of electrodes, as seen in Figure 1 (left); a typical electrode is 1mm², but can be as small as 0.25mm² and could shrink as technology improves. Figure 1 (right) shows a droplet sandwiched between a top and bottom substrate. The bottom substrate contains the 2D array of electrodes, while the top layer contains a single grounding electrode typically deposited onto glass which spans the area covering the entire array of control electrodes. Each layer has a hydrophobic layer deposited onto it before inserting droplets to prevent the droplet from leaving residue behind as it traverses the DMFB. Figure 1: A digital microfluidic biochip (DMFB) is (left) a 2D array of electrodes; (right) a cross-sectional depiction of a DMFB. Figure 2 (left) shows a droplet centered over control electrode CE2 and will remain there while CE2 is activated; however, notice that the droplet is overlapping its neighboring electrodes CE1 and CE3. When CE1 or CE2 is activated, a phenomena known as dielectrophoresis enables an electric field to cause the surface tension of the overlapped portion of the droplet to begin to break toward the newly activated electrode, thus inducing motion toward the electrode. This is seen in Figure 2 (middle, right); as CE3 is activated, the electrode flows to the right to cover both CE2 and CE3. Finally, as CE2 is completely deactivated, the droplet finishes its motion as it centers itself over CE3. Figure 2: A droplet begins centered over control electrode CE2. As CE3 is activated, the droplet stretches/moves to cover CE2 and CE3. Finally, as CE2 is deactivated, the droplet moves to center itself over the only remaining activated electrode (CE3). This process of activating and deactivating electrodes is leveraged to perform basic DMFB operations, as shown in Figure 3: transport, splitting, merging, mixing and storage. Also, droplets can be input from and output to external reservoirs, and the DMFB can be equipped with external sensors, cameras and heating elements to perform detection and heating operations. Figure 3: Basic DMFB operations realized via electrode activations. A digital microfluidic system typically consists of three parts, as seen in Figure 4: a PC controller, a micro-controller and a “wet” DMFB which contains the droplets which perform the microfluidic reaction. The PC controller performs the computations which map a microfluidic reaction to a DMFB; this process is known as synthesis. The synthesis process, performed by the PC controller, yields an electrode activation sequence which is sent to the microcontroller. The microcontroller and its accompanying circuitry essentially amplifies and “plays” this sequence of signals to the DMFB to activate the DMFB’s electrodes, in turn performing the microfluidic reaction. Today, modern DMFBs have optical and capacitive sensors which can communicate back to the PC and microcontroller to help ensure proper execution of the microfluidic reaction. Figure 4: A microfluidic system typically consists of three major parts: a PC controller, a microcontroller and a DMFB. A microfluidic reaction, known as an assay, is mapped to a DMFB via a process known as synthesis, as seen in Figure 5. An assay can be represented as a directed acyclic graph (DAG), where the nodes represent microfluidic operations (e.g. mix, split, etc.) and the edges represent precedence (i.e., order of operations). The left side of Figure 5 depicts a simple assay, represented as a DAG, in which two droplets are input, mixed, and finally, output from the DMFB. Figure 5: Synthesis typically consists of 5 major steps: Scheduling, placement, droplet routing, pin-mapping and wire routing. The first step of synthesis is scheduling. In this step the scheduler assigns an absolute start and stop time to each operation (e.g., the mix operation, M1, will execute from time 1 to 4). The scheduler must ensure that no operation starts before any of its parent operations end and that there are enough resources to simultaneously perform any concurrently scheduled operations (e.g., must ensure that two detection operations are not scheduled at the same time if there is only one available detection module on the DMFB). Figure 5a: Scheduling assigns an absolute start and stop time to each operation. Once a schedule has been computed, placement is performed. The placer decides where on the DMFB to perform each operation. For input operations, an input reservoir containing the appropriate fluid is selected. However, operations such as mixing and splitting can be performed at a variety of different locations on the DMFB. For example, in Figure 5b, the mix operation M1 is placed in the 2×2 array of cells in the top-right corner of the DMFB. However, M1 could be placed in any unoccupied 2×2 array of cells on the DMFB. Furthermore, it may be place in a 4×1 array of cells or 4×2 array of cells, although the time it takes to complete the mix operation may vary based on the size of the chosen array. This temporary array of cells used to denote the location of an operation, regardless of its dimensions, is known as a module. Next, once operations have been scheduled and their corresponding modules have been placed onto the DMFB, droplet routing is performed to compute paths between operations. Operations can be routed from input reservoirs to modules, from modules to modules, and from modules to output reservoirs. Referring back to the scheduled DAG in Figure 5a, the edges also represent the points in the assay when a droplet may need to be routed to a new location on the DMFB. The router must ensure that a droplet reaches its destination and that it does not collide or interfere with any other droplets currently being routed or performing an operation (e.g., a mix could be occurring while other droplets are being routed on the DMFB). Figure 5c: Droplet routing computes paths for droplets to be transported from one operation’s module (or I/O port) to another operation’s module (or I/O port). Once droplet routing is complete, an optional step is sometimes performed called pin-mapping. In an individually addressable DMFB (sometimes called a direct addressing DMFB), each electrode is wired to an external electrical pin on the edge of the DMFB to be driven by the microcontroller such that each electrode can be independently controlled. Individually addressable DMFBs offer the most flexibility in terms of droplet coordination; however, they are expensive to fabricate because the number and complexity of wire routes that must exist to connect each electrode to an external pin on the DMFB can require an increasing number of printed circuit board (PCB) layers, which significantly adds to the cost of a DMFB. Pin-mapping attempts to reduce the wire-routing complexity by connecting multiple electrodes together in such a way that activating a single external pin (via a single signal from the microcontroller) can activate multiple electrodes (in an individually addressable DMFB, activating one pin will always activate one electrode). Devices that use this pin-mapping strategy are called pin-constrained DMFBs. In Figure 5d, the pin-mapping step removes the 10 non-used electrodes and connects the remaining electrodes in such a way that reduces the number of pins from 15 to 7. Figure 5d: Pin-mapping assigns pin-numbers to groupings of electrodes which represent that these electrodes will be tied together, electrically. Thus, activating a single external pin via the microcontroller output will simultaneously activate the corresponding electrodes with the same pin number. Finally, the last stage of synthesis is wire routing. The electrodes reside on the lower substrate of the DMFB (seen in Figure 1), while the wire-routing is performed below this substrate on one or more printed circuit bowel (PCB) layers (the green layer in Figure 5). In an individually addressable DMFB, this stage computes wire-routes to connect each electrode to its own pin on the peripheral of the DMFB, allowing the DMFB to be controlled by the microcontroller signals. In a pin-constrained DMFB, the wire router must first connect all of the electrodes together with the same pin-number. For example, in Figure 5e, all the electrodes with a “1” must be connected together (done so with the red wires), all the electrodes with a “2” must be connected with each other (blue), and so on and so forth. Each network of wires connecting a group of electrodes with the same pin-number is known as a net. Once the nets are connected together, a wire must be routed to connect each net to its own pin on the peripheral of the DMFB. Figure 5e: Wire-routing computes routing paths in the printed circuit board (PCB) layer(s) to connect the electrodes to an external pin on the DMFB that can be driven by the microcontroller. Our primary goal is to see the maturation of digital microfluidic biochips (DMFBs) that are 1.) dynamic in nature, and 2.) generally programmable. 1.) First, it is imperative that DMFBs are dynamic in nature. When we first started into the field in the Fall of 2009, when both Dr. Philip Brisk and I arrived at UCR, DMFBs were statically compiled and were controlled by a deterministic sequence of electrode activations. If any error would occur during a reaction’s operation (e.g., a droplet did not move as intended; a mix operation did not fully mix to the desired level in its pre-allotted time; a droplet did not split with an even 50/50 split), the DMFB would have no way to detect and respond to the error and the reaction would be ruined (see Figure 6). Figure 6: A static synthesis flow, which does not incorporate live feedback, cannot respond to runtime errors. Since assays were statically compiled, complex, long-running algorithms (e.g., it could take hours to compute the operation locations and droplet movements on the DMFB) were used for synthesis because they could be performed once and the resultant, deterministic electrode sequence could be packaged into the DMFB hardware as a sort of software binary. Thus, an end-user would never have to sit and wait while synthesis (i.e., basically, the computation of droplet movements) was being performed. However, if an error occurs, then the deterministic sequence of electrode activations is no longer valid and will need to be recomputed. As a result, out of a necessity to respond to errors and live feedback, these long-running algorithms were no longer suitable for dynamic DMFBs that need to re-perform all or parts of synthesis while an assay is being executed (meaning the end-user will have to wait while re-synthesis is being performed). 2.) Secondly, it is crucial that DMFBs remain generally programmable. In an effort to optimize and reduce the cost of DMFBs, many works have been published in the microfluidics community detailing algorithms to design assay-specific DMFBs. Although there is a valuable place for this type of research, this means that only a few, select applications will make their way to DMFB technologies, as seen fit and profitable by the handful of DMFB companies currently in existence. In contrast, we believe that the continued development of generally programmable DMFBs would enable researchers around to globe to run THEIR OWN experimental assays, allowing this emerging technology the exposure and traction that it needs to fully catch on in the scientific community and general populous. Just as the iPhone is made useful by its robust app market, we believe that DMFBs will become ubiquitous as independent researchers are able to contribute their own DMFB assay protocols to the scientific community for fast, concise, and reliable reproduction of scientific experiments and clinical tests. Imagine an assay is developed to detect a new strain of flu. Instead of having to develop a unique DMFB hardware solution, an end-user (presumably a physician’s office, but, perhaps, someday a patient him/herself) can simply download and install the new assay protocol onto their programmable DMFB and purchase a “fluids kit” that has the necessary reagents to perform the assay (Figure 7). This overall usage flow promises to be much more efficient concerning both time and money. Figure 7: A DMFB “App Store” would allow a user to download an assay specification to run on their own DMFB; separate fluid kits could be developed and purchased, as well. This section is meant to provide a very brief highlight of our key works in synthesis of DMFBs. Please refer to my publications page for a complete list of published conference and journal papers and for more details on specific contributions. Most of our work has been directed toward Goal #1 (see last section for more details): dynamically executing DMFBs. DMFBs that are dynamic in nature require fast algorithms that can quickly reconfigure the DMFB on-the-fly in the presence of errors from live feedback. Of all the major synthesis steps, scheduling is known to have the biggest impact on the overall runtime of an assay. Thus, in DAC 2012 and VLSI-SOC 2012, we present two separate scheduling algorithms that can produce quality schedules in just milliseconds, making them applicable to dynamic synthesis. Toward Goal #1, we also present several virtual topologies. In traditional synthesis, operations can be performed anywhere on a DMFB (see Video 3). In GLS-VLSI 2012, we present a tiled virtual topology that is modeled similarly to a 2D-mesh of processors. Videos 1 and 2 show that we are able to coordinate a massive number of droplets, while preventing deadlock (i.e., droplets are guaranteed to reach their destination), in just milliseconds. Prior methods could take seconds to hours computing routes for far less droplets and would often result in deadlock (unroutable scenarios). Video 1: Random traffic being inserted onto a 40×40 DMFB. The simulation shows that the virtual topology and routing algorithms used can provably eliminate droplet routing deadlock in DMFBs, even with heavily congested traffic. Video 2: Random traffic being inserted onto a 80×80 DMFB. The simulation shows that the virtual topology and routing algorithms used can provably eliminate droplet routing deadlock in DMFBs, even with heavily congested traffic. In CODES+ISSS 2012, we present a second virtual topology. This virtual topology uses much less space and is more efficient than the first topology. Video 4 shows a protein assay being executed (same assay as seen in Video 1); the key contribution here is that the entire synthesis flow is computed in milliseconds and is guaranteed to produce a valid solution if scheduled properly (not guaranteed by prior synthesis methods). Video 3: This video depicts a simulation of a protein assay being executed on a 15×19 DMFB. The placement is performed using a chaotic placer using a KAMER (Keep All Maximum Empty Rectangles) Linked-List implementation. Video 4: This video depicts a simulation of a protein assay being executed on a 15×19 DMFB. using the virtual topology described in our CODES+ISSS 2012 paper. In DAC 2013, we present a field-programmable, pin-constrained DMFB topology. As described in the pin-mapping and wire-routing sections, pin-constrained devices are often designed to reduce the wiring complexity (and hence, the cost) of a DMFB. However, this process is usually done by optimizing a DMFB for one particular reaction; thus, pin-constrained devices are billed as inexpensive, but can often only perform one or two different reactions. Our field-programmable, pin-constrained device can be wire-routed in a single printed circuit board (PCB) layer, but is designed to execute general microfluidic instructions, making it both inexpensive and general-purpose in nature. Videos 5 and 6 show a small protein reaction being executed on one of our field-programmable, pin-constrained designs. Video 5: This video depicts a simulation of a small protein assay being executed on a 12×18 field-programmable, pin-constrained DMFB from DAC 2013. Video 6: This video depicts the routing steps of Video 5 at 1Hz (small protein assay being executed on a 12×18 field-programmable, pin-constrained DMFB from DAC 2013).